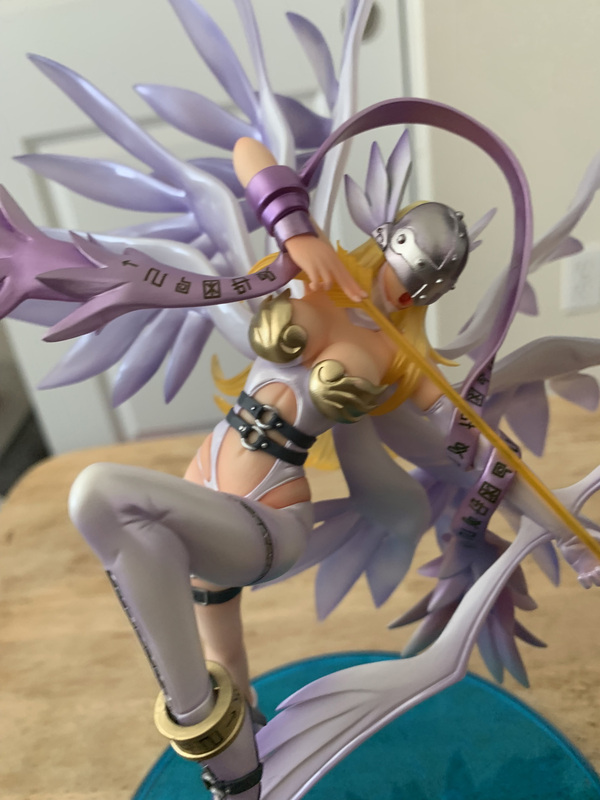 New figure breakdown with a bunch of photos! 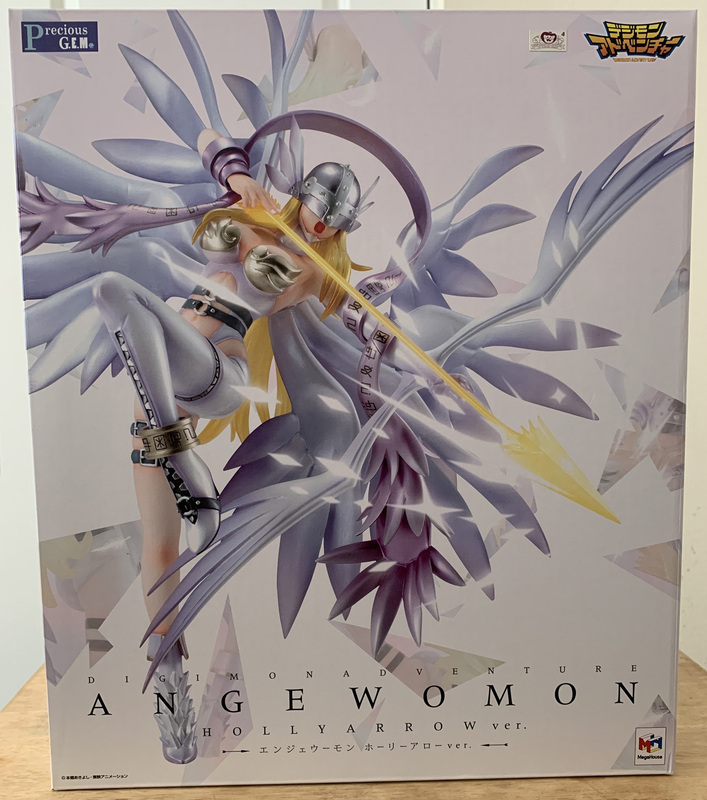 Precious GEM Angewomon Holy Arrow Version! Released a couple months ago in Japan, with the US version releasing roughly a week ago, the 3rd Precious GEM Digimon figure (an expansion of the GEM figure brand) has been one awaited by fans, partially because we never got the original GEM Angewomon figure, so it was rather hard to track down. We first saw the figure almost a year ago as an unpainted prototype, and it has been shown off in many places since then. There are no scans this time. The box was massive, so I didn't even pull out my scanner as it simply wouldn't have fit. Instead I decided to try my best at photographing everything, manual sheets included! 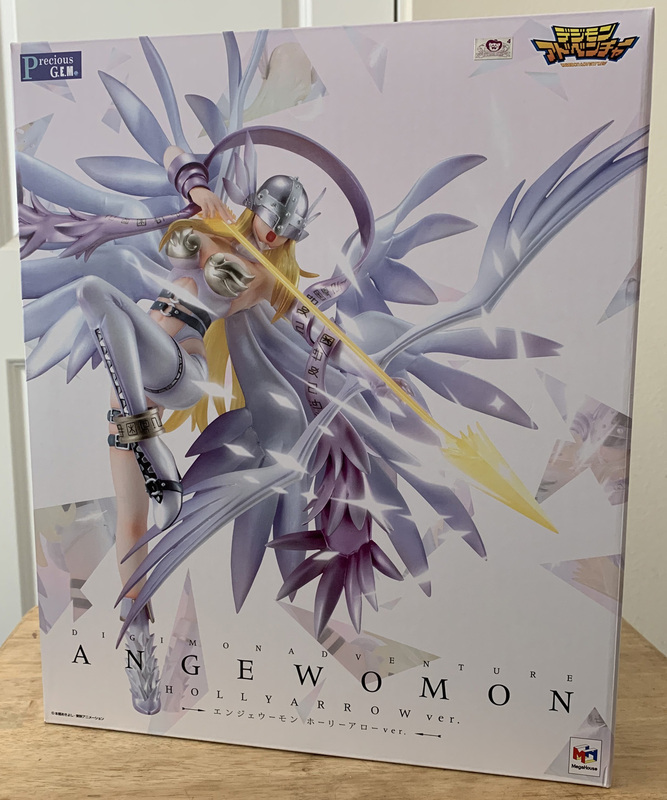 The font of the package has a really nice look to it, with a sort of shattered glass effect. We see a nice shot of the figure, along with various reflections in 'mock' broken glass. Some drawn in diamonds are used to add to the visual effect of the arrow. The front features the Precious GEM, Adventure, and Megahouse logo, along with a unique text logo for the figure itself, which integrates Angewomon's name, the anime title, and the specific figure name itself in both English and Japanese. Unfortunately they spelled Holy as Holly. This is an odd mistake that Bandai seems to continually make, seemingly at random. 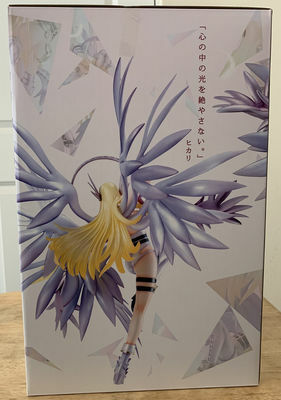 The front of the box looks nice, and it really puts the figure front and center in a memorable way. While it's to bad about the misspelling, there is one other oddity. 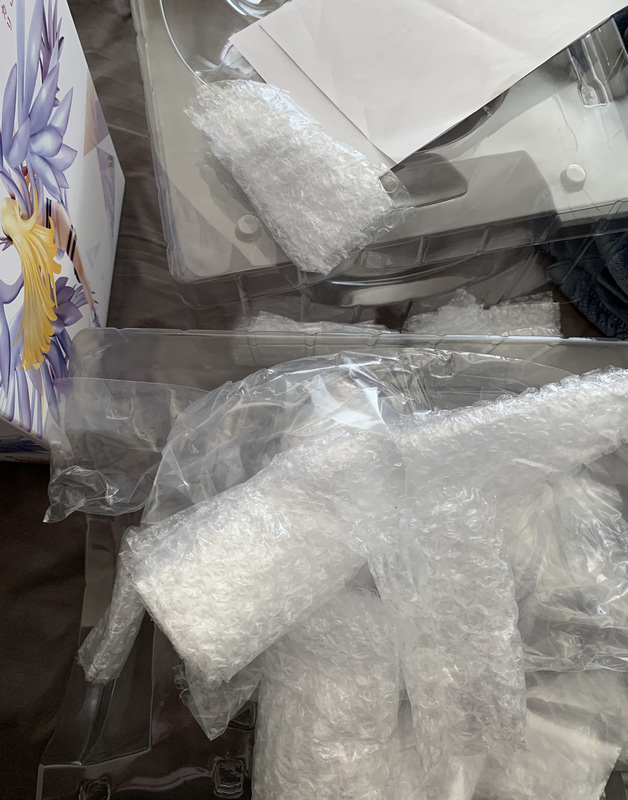 Despite being released after other products that used it a touch early, the Digimon Adventure 20th logo doesn't appear on the front of the box. 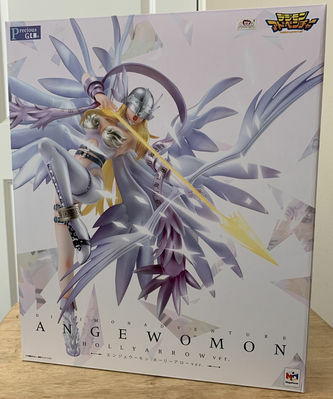 The sides of the box features the same broken glass style, along with shots of the figure at different angles. 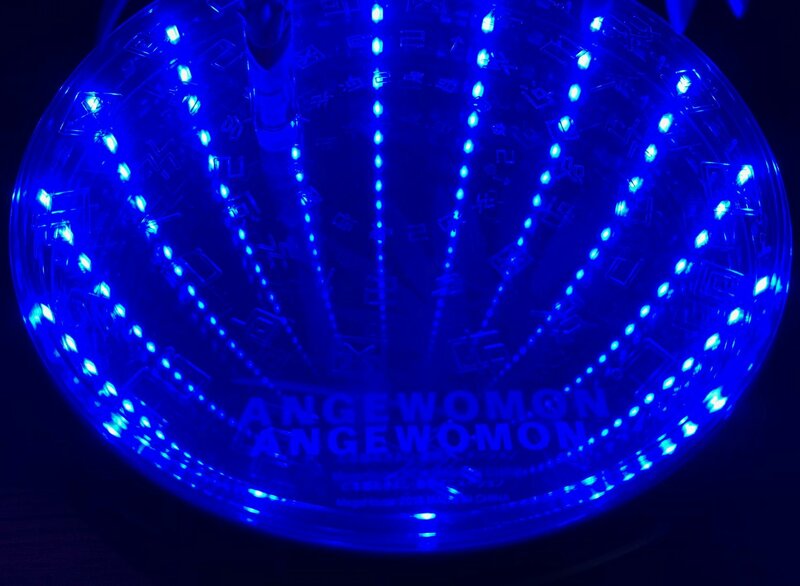 The quote on the left side is "(I) wont let the light inside (my) heart diminish/disappear. 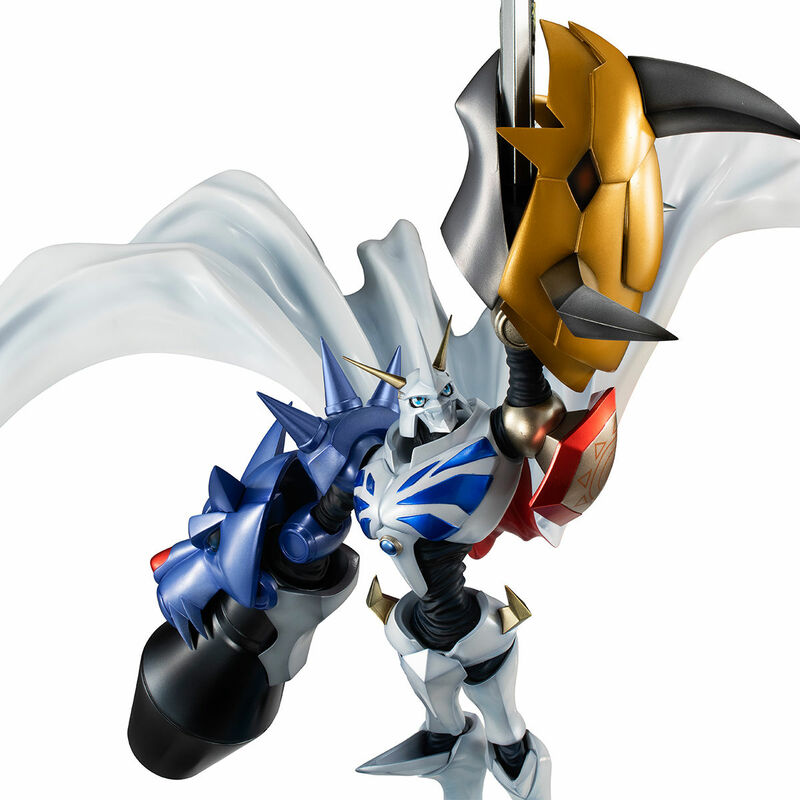 -Hikari"
The quote on the right side is "Playtime is over. Prepare yourself." 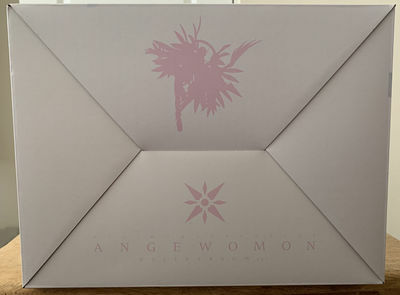 The top features the same name styling as on the front of the box, with a different image, angled to give a more direct appearance of Angewomon's face. 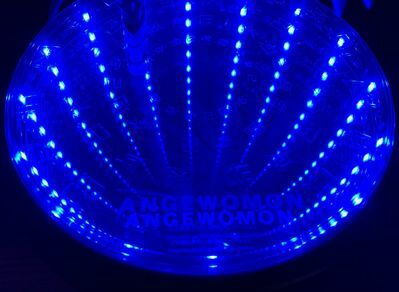 The bottom features a silhouette of the figure and the crest of light, along with the product name, all in the same shade of pink. 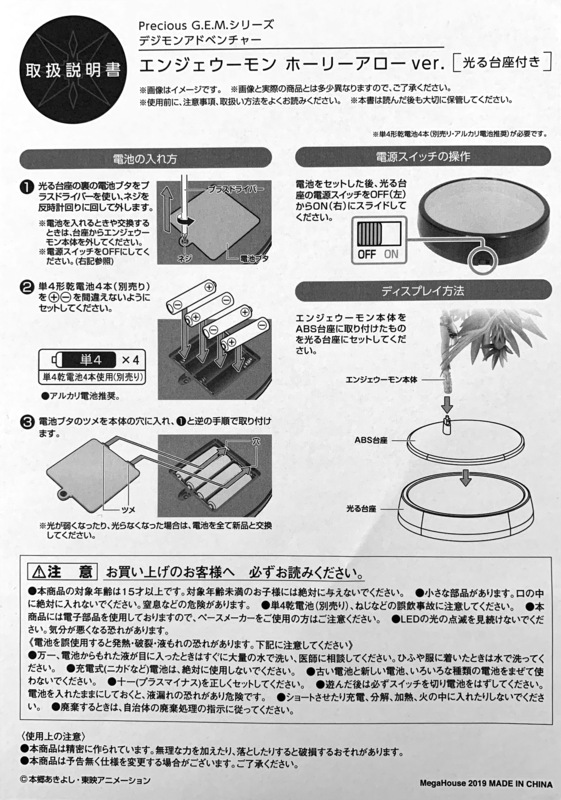 The instructions are two small sheets. 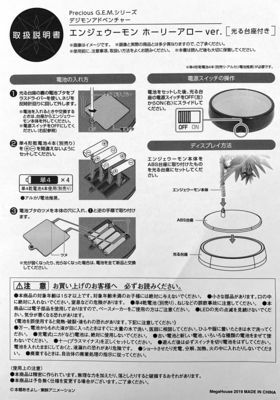 They are in Japanese, but with the pictures most is clear enough. 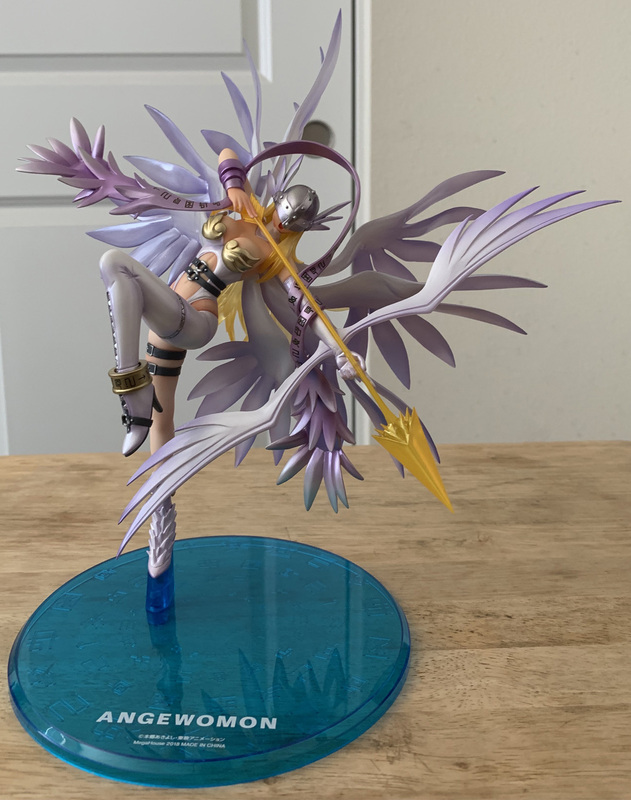 The first shows how to attach the arrow to Angewomon, while the second shows putting batteries in the LED stand, along with attaching the figure to the various stand. 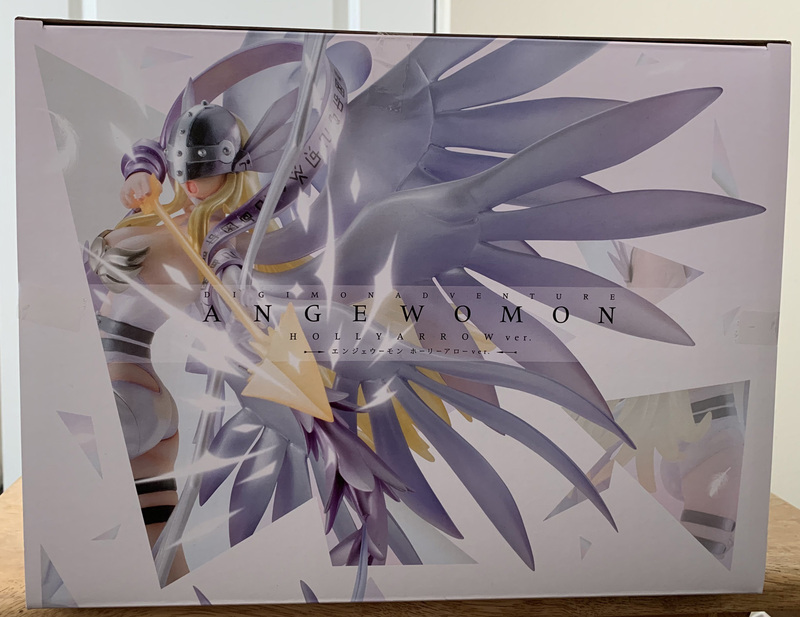 These sheets were reasonably small, but since the box was so huge and I didn't pull out my scanner, I just photographed them. The size meant that it was easy to photograph and still have information be viewable and text readable. The primary figure stand is a clear blue plastic with Angewomon printed on it. It includes metal pieces that plug into Angewomon's foot to attach the figure, and it sort of snaps into place very solidly. 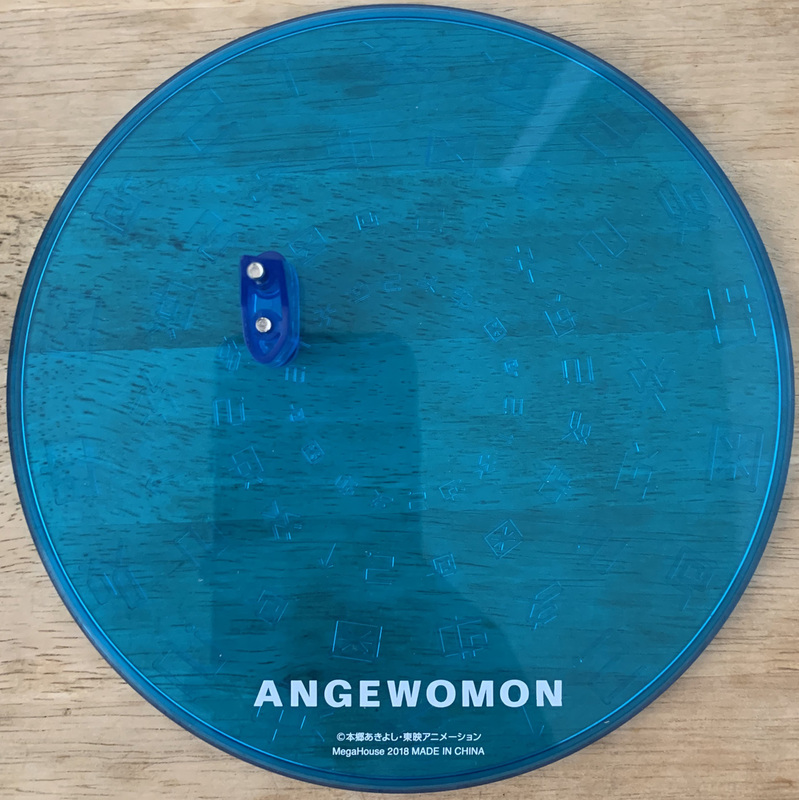 Digimoji is molded around the stand creating an interesting visual effect. The holy arrow itself comes packaged as it's own piece rather than being held by Angewomon, for shipping protection. 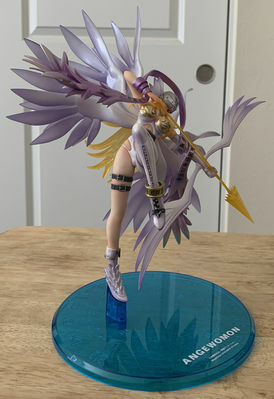 This was the LED stand version, so it also included that accessory, but we will get back to that later. 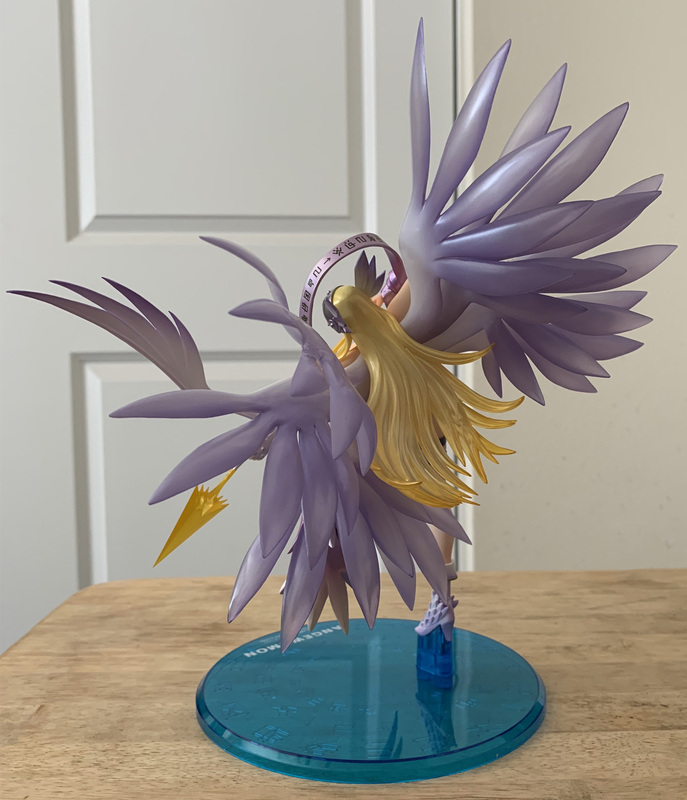 But, differently than with the Digivolving Spirits... this one doesn't require transformation, or extra effort to get posed nicely, so I went ahead and tried doing a whole gallery of images. 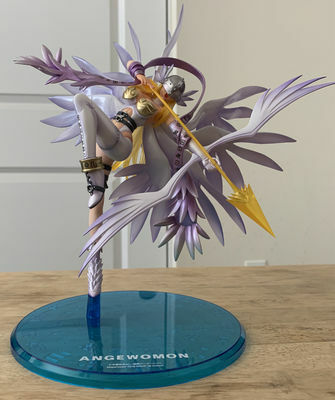 Angewomon looks nice from every angle, with the way the paint catches light looking quite good. 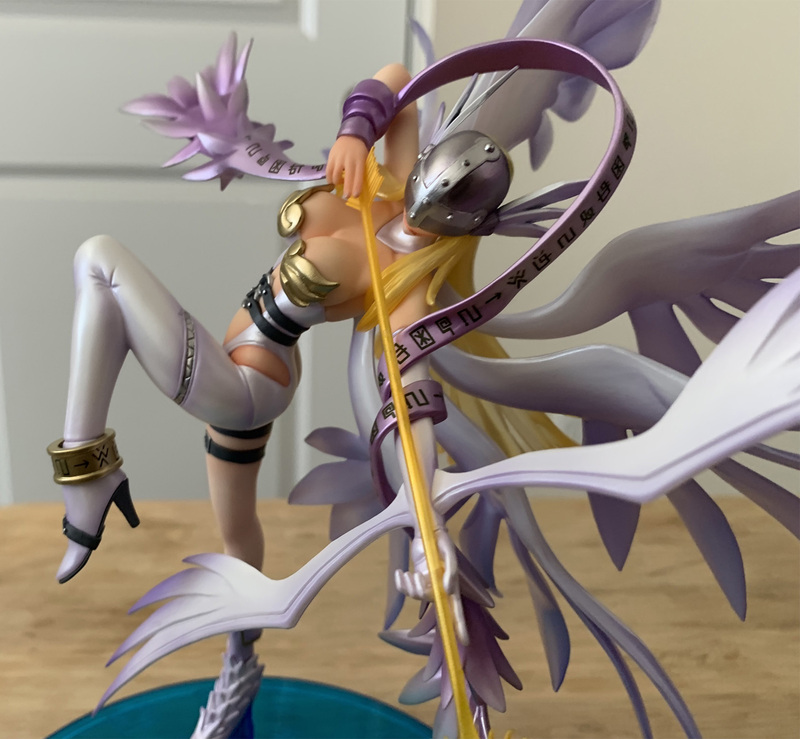 Various other shots of the figure. 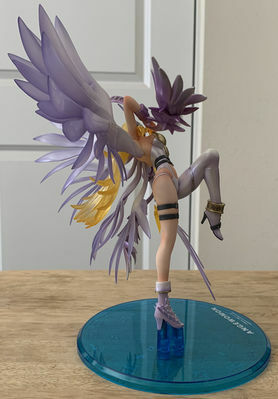 The pose overall has a nice look to it, but one touch I like, is how often the colors change on pieces. 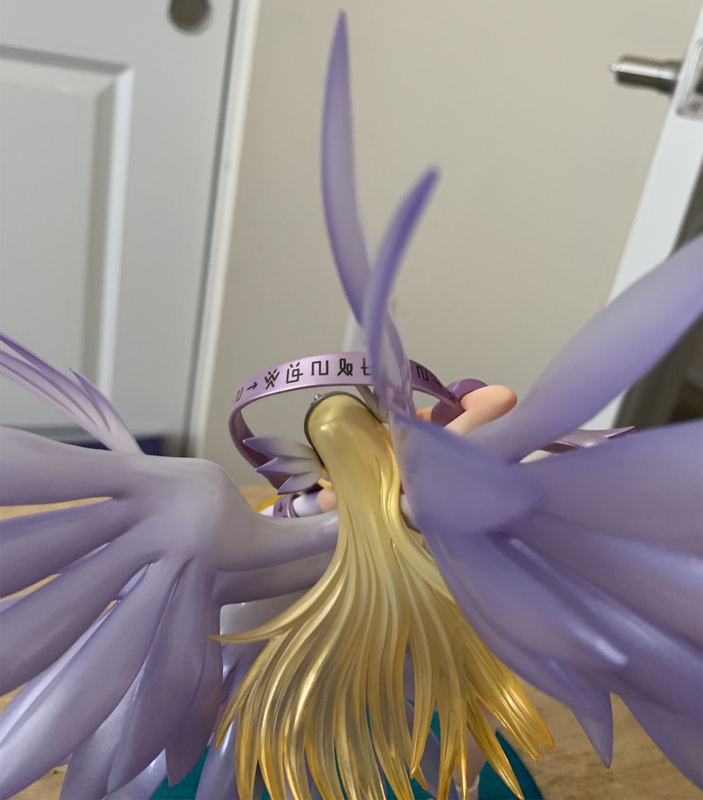 Most distinct and notable is how the pearl coloring style paint shifts more purply as it goes on, and how the hair shifts from more to less opaque. The figure on the LED stand looks rather nice. 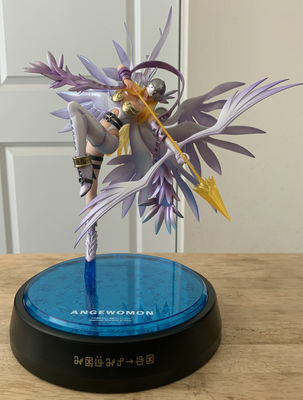 It has a nice raised platform appearance, and it's sized so you can just place the figure on the normal stand on it. 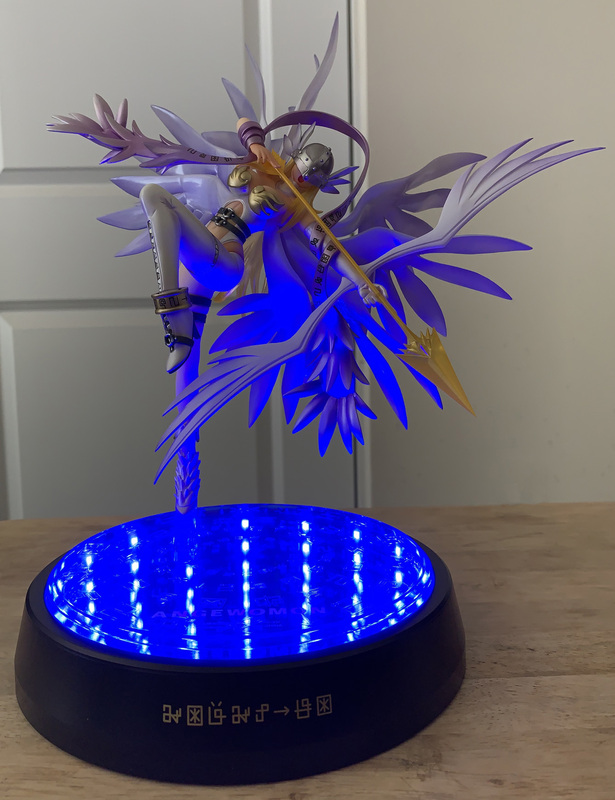 The LED stand has a slightly raised lip so it won't fall off, but I wouldn't recommend trying to move the figure without taking it off the LED stand. 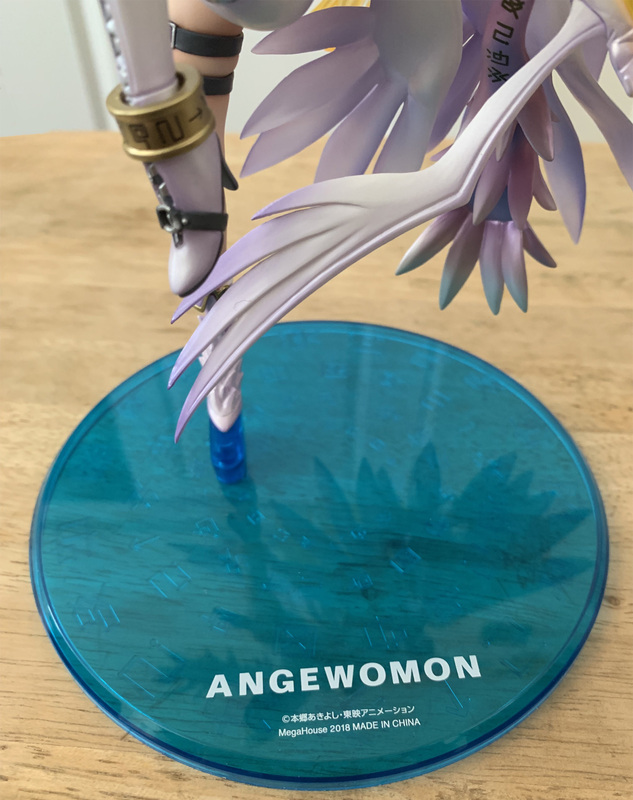 The text on the front of the LED stand is digimoji that spell out Angewomon. 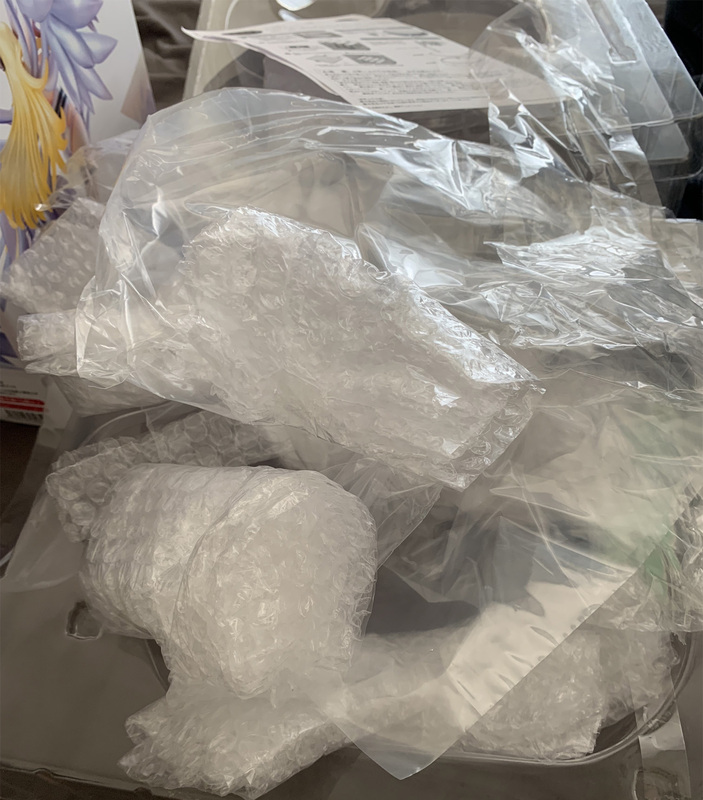 Look at all this bubble wrap and packaging! 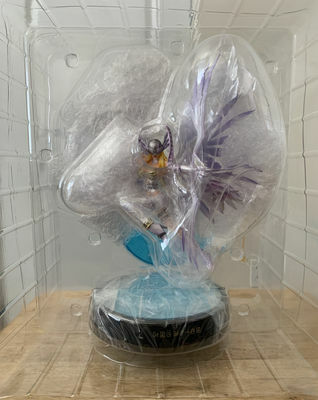 Inside the box is a rather large protective shell, which is just stuffed with bubble wrap and protective plastic so the figure can't move at all. The clip seals were actually done tighter than you'd expect and it's size made it a touch annoying to actually open up. The prior GEM Angewomon had major issues arriving intact when it came out in Japan, so it's always been more likely they used international stock to replace those broken orders in Japan and then cut their losses. 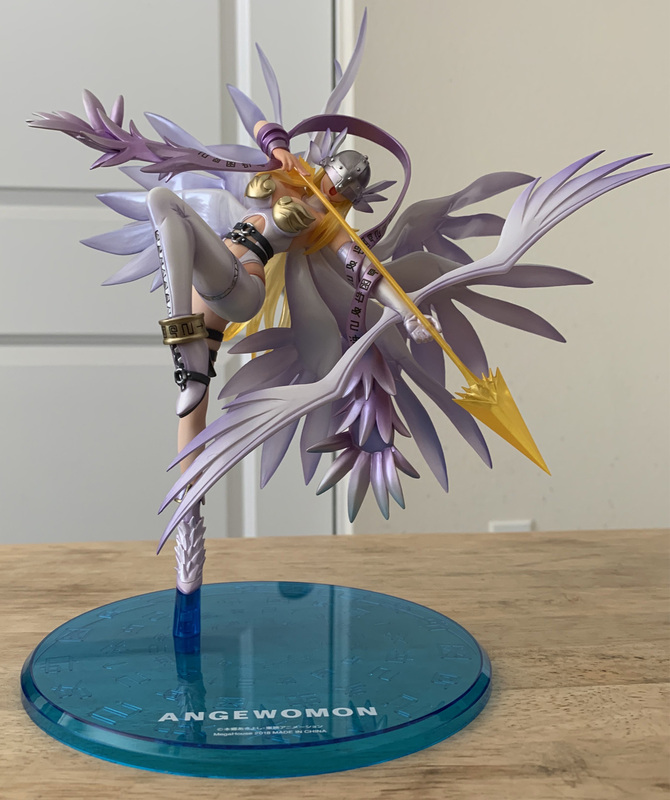 The wings on this Angewomon are fragile, but have some give to them to hopefully keep that from happening to a large degree. The packaging means the box is pretty big compared to the figure. 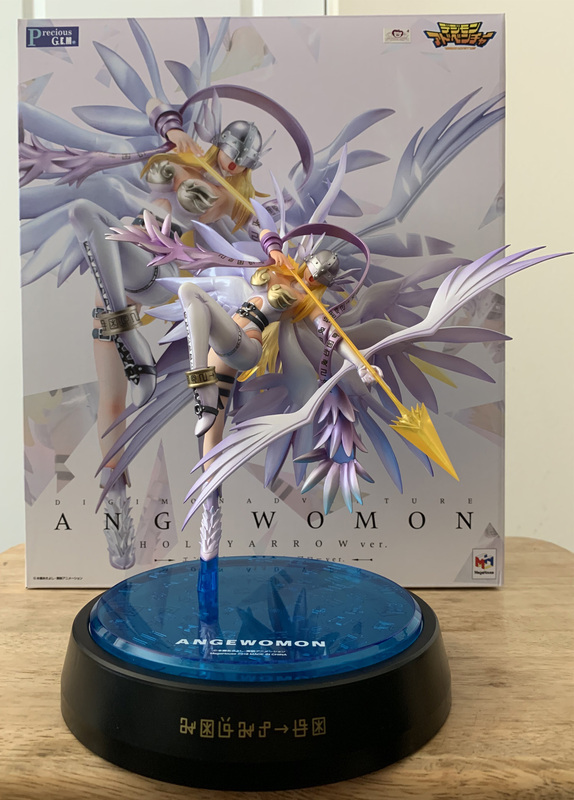 Precious GEM Angewomon Holy Arrow Version is a rather impressive looking figure, which should generally make fans who missed out last time quite happy. If you get the version with the LED base (which ends up being an extra $20) you get a stand with an interesting visual effect, but whether it's worth the money or not it's hard to say. 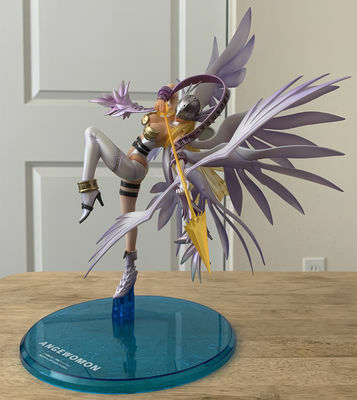 And we also have details and pre-orders for 2 more upcoming Digimon GEM releases, both Precious GEMs at that! 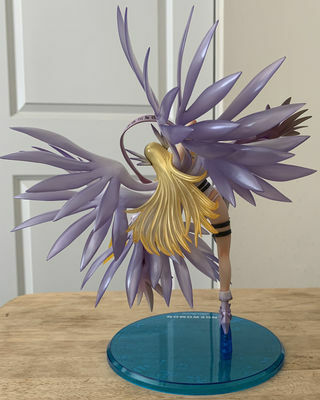 There have also been prototype images of Beelzebumon and Behemoth, along with them showing off the results of fan votes, effectively teasing what 'may' be future figures. 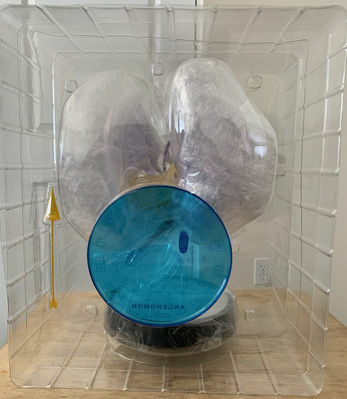 The photographs were shrunk and edited as needed and were taken with a phone with whatever natural light was in the room at the time. Damn, that's some amazing balance. Not my favorite character with the insistence on pandering to the male gaze, but it's an impressive figure nonetheless. 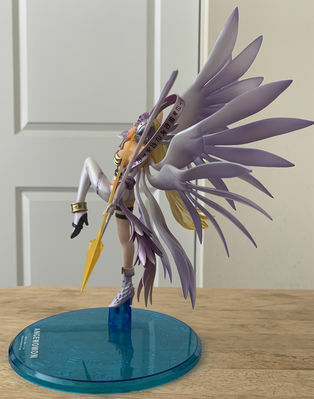 I love the stand too, wish they'd sell something like that separately. 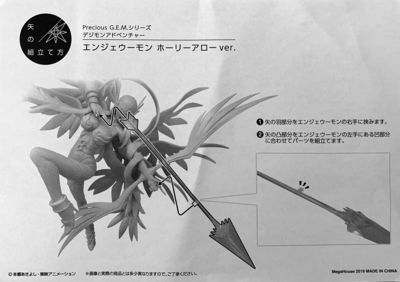 I kinda figured they were giving up on smaller GEM releases and were switching to the premium versions, but who knows. Looks pretty nice. 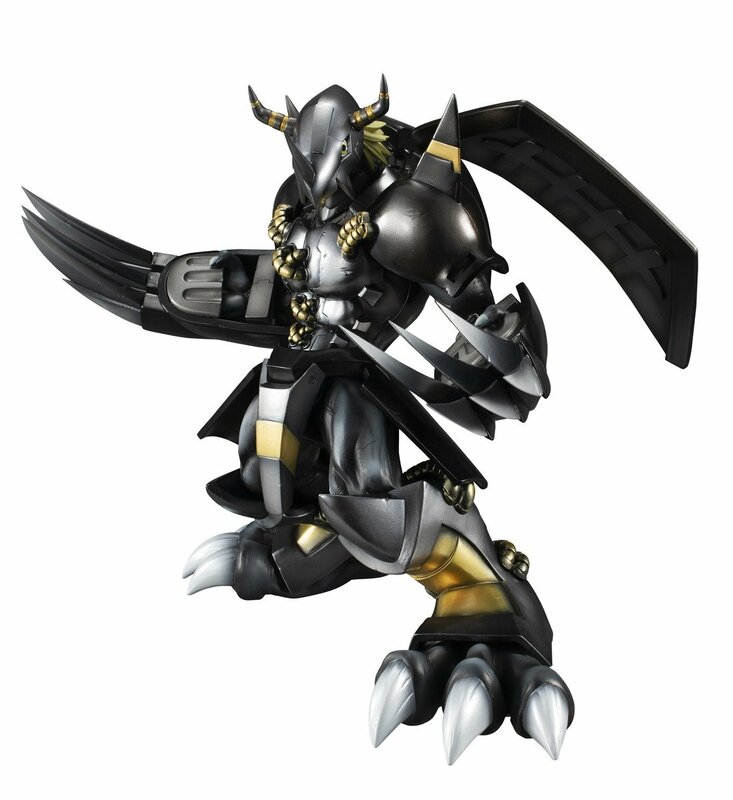 If I ever get the LadyDevimon G.E.M figure I might get it for contrast. 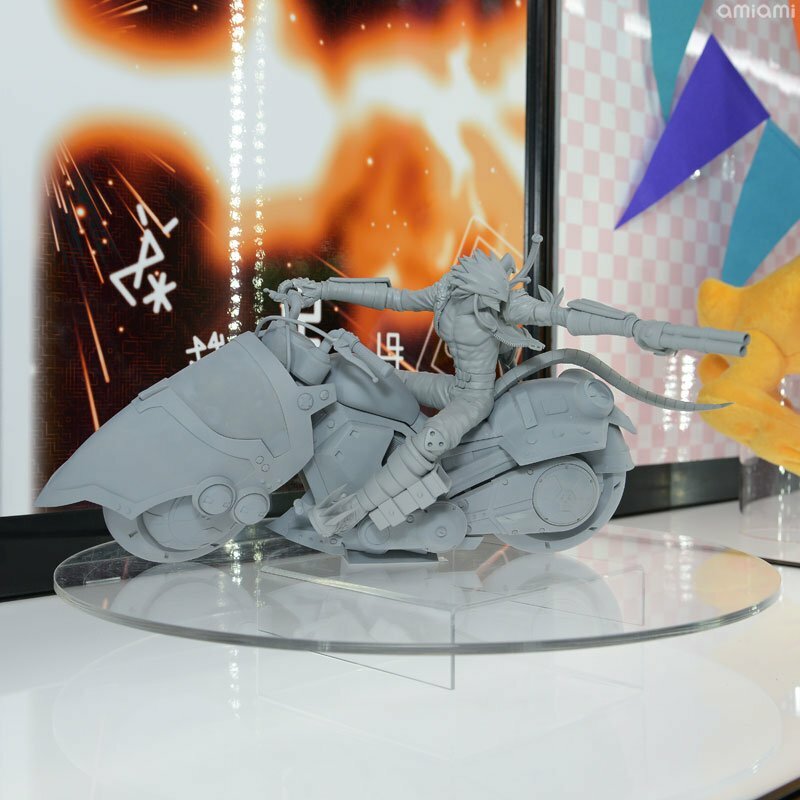 The Beelzemon figure looks great: I love the motorcycle!